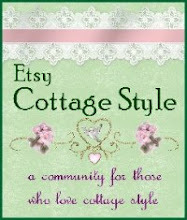 Recycled Rita: Available tonight on Etsy! This little sweetie is one of my favorites of the bunch! Rust and Lace you can't get better than that! It is a little hard plastic container that looks like a small cloche. It is 4 3/4" approx. and has a lace detail at the bottom. I have re-covered the bottom with a pretty floral ticking paper and a polka dot bottom. 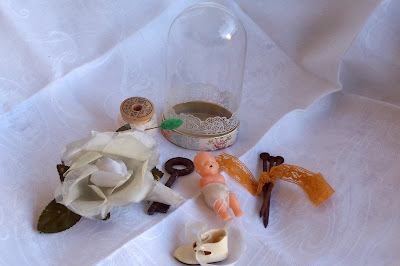 I have given you some wonderful little "display pieces" , a baby who is missing her arms, 3 rusty nails tied with gold lace, a vintage baby doll shoe, an old skeleton key, some cream lingerie lace on a wood spool and a vintage millinery flower! Oh la la! 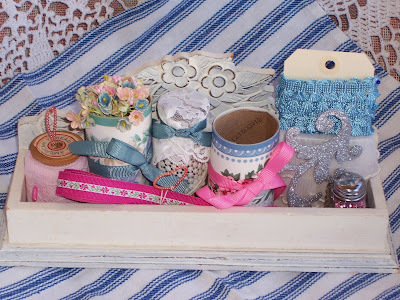 This pretty set has 2 rolls of 18" of wallpaper border, a small bottle which is half full of buttons-vintage and new, a pretty pink floral trim tied with a beaded heart, vintage soft pink lace, a small salt shaker filled with pink glass glitter, a card of 2 vintage trims, vintage paper posie bouquet and a little glitter decoration! Sparkly and pretty in pinks and blues! 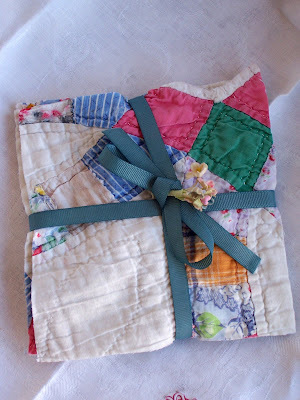 My last offerings are 3 sets of 3 - 6" squares taken from the tattered quilt I bought yesterday. I like to share the wealth! 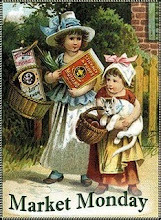 I have one little errand to do and then I will be posting them. I will also be posting some more fun sets in the next couple of days! Happy Sunday! So glad I found you Karen! I have marked you as a fav now! I snagged the cute white kit with goodies and love that American tourister!! Cucumbers and Squash and a pepper Oh My! My Fun Finds and a trashy novel or two!